It's been a while - I actually wrote a blog while I was in Hue, but decided to scrap it as it was quite offensive to the Vietnamese (more like my usual dialog for those who know me well). In the last couple of days, most of our group, myself included, has reached a sort of breaking point, or saturation with the Vietnamese people. Although the place is beautiful, and the people are friendly, it slowly wears you down having the same conversation 50 times a day that goes along the lines: Where you from? Australia Sydney or Melbourne? Hobart (I've started adding, Hobart - there are actually more than 2 cities in Australia you know) How long in Hoi An/Hue etc? (They ask this to gauge how much you've probably bought already) You come to my shop/buy my clothes? No Why Not? etc etc My answers to why not are becoming more and more ridiculous the longer this has been going on just to see what responses they come up with next. After weeks of being seen as an open wallet I finally snapped on our bus ride from Hue to Hoi An. We stoped at a roadside collection of stalls where there was a public toilet. I was the first one of our group to use the facilitiesw, and as I walked out, this woman came running out of nowhere screaming at me in a downpour of Vietnamese. I finally worked out she expected me to pay 5000 Dong (I know only 0.50c, but thats beside the point) for the use of 'her' toilet, sorry, her concrete shed with a trough. Then I lost it. Apparantly, everyone in the group who witnessed my response were disappointed the didn't get a photo and video of my reaction. It actually wasn't that bad, but it was lucky our tour guide was there to smooth it over. Like I said, the blog I wrote after that wasn't that flattering the the Vietnamese people - it was how I was feeling at the time and I would like a record of it so I may post it later (probably after I leave the country) Now I've got that off my chest - so heres an update of what I've been doing recently. Hue: Spent 2 days here, but no pictures. My camera broke and it took 3 goes to get it repaired. It's OK now, but I will buy a new one in Saigon cause I don't trust it - praise travel insurance! We did a motorcycle tour of the city one day - it was amazing, one highpoint of the tour. Went along buffalo trails, alleyways and dirt tracks through pine forest. Will try to upload movies somehow. Hoi An: Beautiful city. Shoppers paradise again - get a suit tailor made for for $100. The girls went crazy. Amazing food as well, banana and lime shakes, cakes aplenty and tasty seafood. 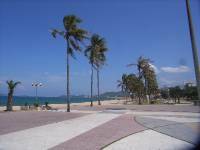 Nha Trang: Gold Coast in training. This is the beach resort capital of Vietnam - highrises are going up along the beach front, but the beach is beautiful. We went to the mud baths yesterday and then had a massage afterwards (all for $11AU). The mud was awesome - if been in the sea and pool and my skin still feels good! Thats it for now - we leave for Saigon tonight. More photos tomorrow hopefully.